The Uniondale School District’s Smith Street Elementary School recently honored first grade students for being “Super Writers." Uniondale School District Smith Street School first grade students hold pictures of where to find their favorite bugs from the perspective of a frog. They were recently honored for being “Super Writers” as part of an ongoing District initiative to promote literacy and creativity through fun, interactive activities. Photo by: Uniondale School District. Uniondale, NY - November 16, 2016 - The Uniondale School District’s Smith Street Elementary School recently honored first grade students for being “Super Writers,” and demonstrating a commitment to improving their creativity and handwriting. 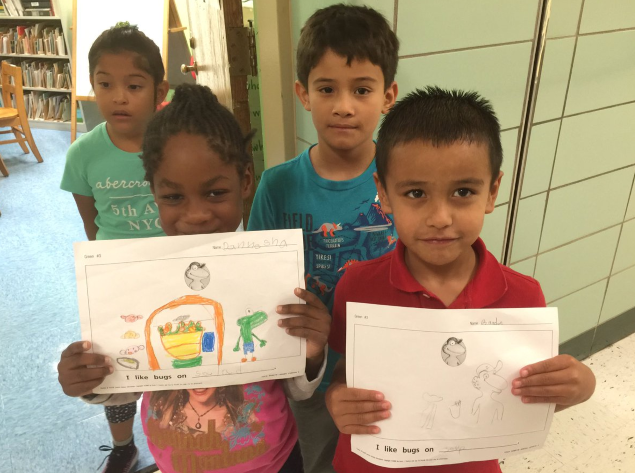 As part of their classroom activity and award, students drew pictures of where to find their favorite bugs from the perspective of a frog. They then presented their drawings to their classmates. This event was part of the Smith Street Elementary School District’s mission to promote literacy and creativity, as well as to encourage students to develop a love of learning through fun, interactive activities. YOU ARE WONDERFUL  WHEN WILL THEY NOTICE ? Subject: LongIsland.com - Your Name sent you Article details of "Uniondale School District Students Are Super Writers"